Like in September, I processed the downloaded Dotlan data for October 2015. Let's see the ratting charts first: You can see that Bloody Omir did a great job. Highsec ratting increased a lot, nullsec got a new record. Lowsec didn't simply got a new record, but beaten the old one by 20%! I'm pretty sure that such "holiday events" (WoW term) will be very common. I wonder who will come in Christmas. Maybe SoE will ask for our help to bring presents to poor kids in planets breaking blockades of Grinchy pirates? Seems someone moved to this zone and hit ratters hard. Checking the killboard of these systems shown awful lot of presence from a certain alliance, but the diplomatic update of the Evil called them irrelevant 8 times, so they can't be the reason. Probably Bloody Omir caused that 1T worth of loss of income to Goons. It's hard to not see that all Imperium alliances lost rats in October (except - you guessed it - SMA). Russians and renters increased their performance. It worth noting that XWX increased rats, lost land and still underusing its land horribly, so I expect further growth and consolidation. Other winners were Esoteria dwellers and ALTS. The whole Imperium lost ratting, providing the worst performance in the last half year. The numbers don't match with the older posts because I added Void.. to the Imperium retroactively. "Seems someone moved to this zone and hit ratters hard." But MoA ISK damage has been dropping for the last two months. How is there a correlation between their reduced effectiveness and the 1 trillion Goonie loss, if they are not inversely proportional? Unless this drop is the effect of the record-breaking August and it just took two months to visualise. If next month has a 20% ratting increase, I guess we will have our answer. If not, we will have to find another reason for the ratting drop. MoA damage isn't "dropping for the last two months". It was record high in the previous months. Their October performance is above their 1 year average. Also, roams get less kills than camps but scare ratters off more. Nobody is scared of MoA. They are still irrelevant. As always, you're backing the wrong horse by donating your cash to Gen Eve. How many more years will you do that before you realise that nothing has changed? That's an honest question, maybe one you can do a post about. 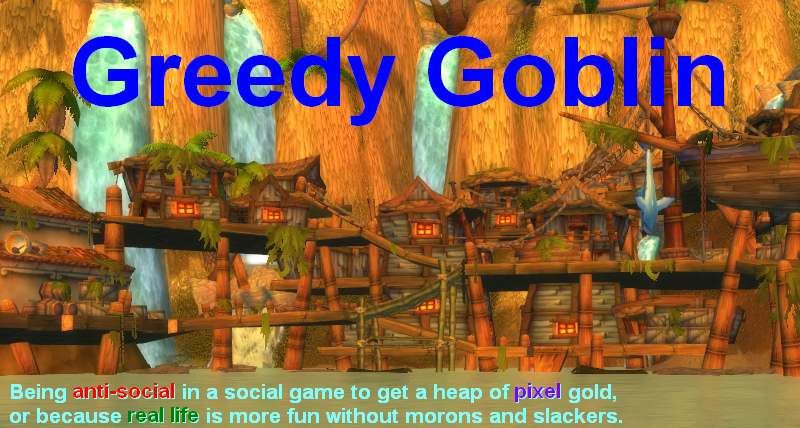 Well, 1/3 of the Goon ratters were scared enough to stay docked for a month. I don't like the second one. So the answer to your question is "I keep doing it until Goons break or some group becomes more proficient in killing Goons than MoA"
"Well, 1/3 of the Goon ratters were scared enough to stay docked for a month." You say that, but that's only one of a near infinite number of potential reasons for people ratting less. I know that I've not heard a of a single person saying "I'm not ratting because MoA are about" or "It's too dangerous". There's a 3rd option - look for an alternate method of defeating your enemy. The only reason you see those 2 as your only options is because you have the fixed conclusion that the only way to win is by paying for people to be killed measured on isk value. The thing is, you know that the amount of isk they bring is is far more than they lose, far more than you can ever hope to cause them to lose. As time goes on and goons gain more players it becomes clear that killing them at random is doing nothing. If anything it's benefiting them as they always have people to shoot. It would be a far better plan to look for a fresh strategy. Figure out what it is that you can affect that goons can't live without and attack that, or find a group that can damage them from an infrastructure standpoint. Going against them in kill values will never work because you can't possibly fund enough players to deplete their near infinite income. I can't. More funders can. I hope that people leave their apathy and impotent raging and start donating to anti-Goon groups. "I can't. More funders can. I hope that people leave their apathy and impotent raging and start donating to anti-Goon groups." First off, I'm not sure funding is the issue. Funding and values of kills don't directly correlate, and there will be more rapidly diminishing returns as the funding ticks up. Secondly, your plan is to hope that other people join in? I'm pretty sure if someone told you their plan for victory in a game was to hope that other random people joined in, you'd call them an M&S. Don't wait for victory, take it. Check kill boards again DNS moved north. Hunting over the wall for whales. Went from target rich to crickets. @Anon: giving more and more money to MoA has diminishing returns. Giving money to more groups works better. It's theoretically impossible that I alone can destroy a 40K organization. I can be a huge thorn yes. I can be the #1 enemy. But alone, can't possibly win. No matter what the plan is, it requires other people. I've checked the files, they did 24.9B damage. 11% of MoA. "giving more and more money to MoA has diminishing returns. Giving money to more groups works better." Giving more money even to more groups has diminishing returns. If you pay MoA 10b for 100b kills, paying another equally competent group won't result in 100b kills. They get in each others way, they find it harder to find targets, and more targets actively avoid them or seek them out in combat ships reducing their efficiency. The thing is, you say you can be the #1 enemy, but you can only do that based one your own metrics. Like how Harry Forever frequently claimed to be the #1 goon enemy based on how many cyno ships he kills in VFK. The truth is that other large sov holders are and always will be the goon enemy, because they are the only ones that threaten them in a way that could actually cause them problems. It's nto really a good victory to say "Based on metric that I've chosen because they show that I'm winning, I'm winning". I won WoW once because I had the most silk cloth. "It's theoretically impossible that I alone can destroy a 40K organization. I can be a huge thorn yes. I can be the #1 enemy. But alone, can't possibly win. No matter what the plan is, it requires other people." Individuals have killed organizations before, it just requires a little out of the box thinking. If you have a plan that involves other people, then start working on it, instead of just increasing the wallets of the MOA leadership. Mid terms (things that are not in game) + half of goons deployed south + people moving back from ratting in pure blind + a number of carrier alts un-subscribing = reasons for lost ratting income. If you paid any attention to your statistics you would notice a 0.7 to 2.6 (almost 300%) increase in Pure Blind ratting - nice observation, Gevlon. I'm sure you'll keep this post from being posted as it shows your inability to understand in-game trends related to goons due to your blinding anger for them. The region of Deklein you illustrated for your example of ratting losses are specifically the ones "Theta Squad" rats in. They were all deployed into pure blind during the month of October which can account for the losses in ratting numbers as there are roughly ~100 active ratting accounts affiliated with Theta averaging 15-20b a month. Obviously all actions have diminishing returns. But still, more money = more dead Goons. Also, enough groups = joint ops for entosising systems. MoA alone can take systems but can't hold them. 5 MoAs could hold the field. Other Sov holders kill no Goons, take no systems, they make deals. 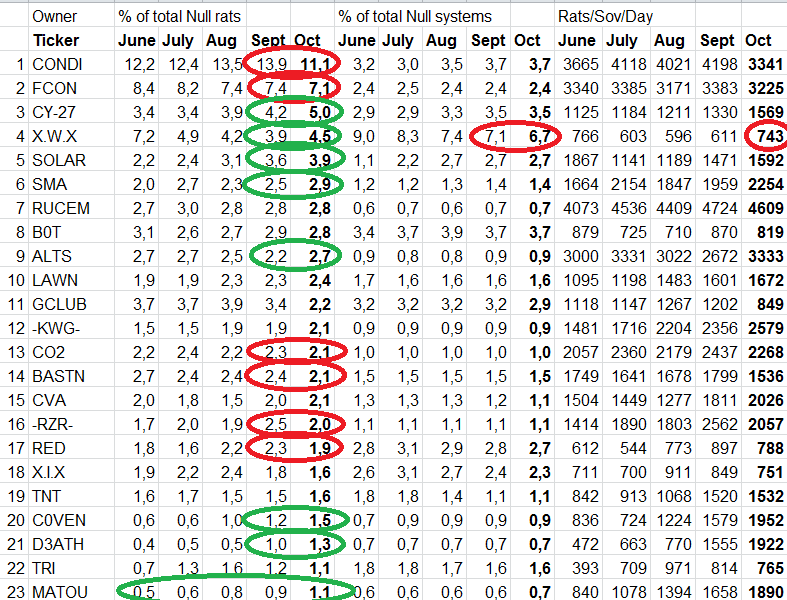 Actually PB had 2.0 ratting in Sept and 2.6 in Oct. Not really 300%. 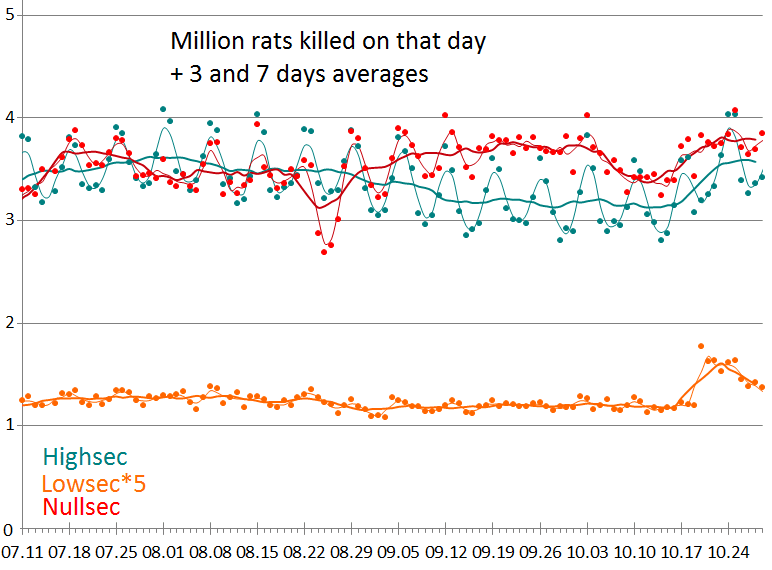 Also, CONDI overall lost 2.8M rats, so they aren't ratting elsewhere (unless they rat in SMA space). What Theta did in PB? 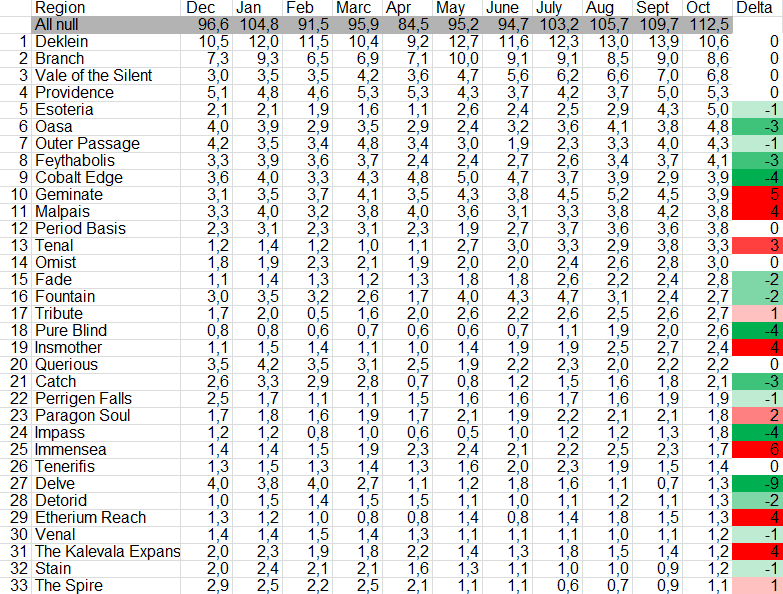 Oh wait, the monthly loss report says that PB was the #1 Imperium loss field. So they went there to die. @Gevlon How much of the MoA damage to goons is Raging Angels/Ducks? I don't see many other MoAs around in Deklein very often but Glenarvon & friends are there pretty much every day. Yes, Pure Blind was a battlefield for many fights, hence the losses. Theta managed to keep MOA perma-docked for the majority of October, I remember MOA actually deploying else where because of it. I wonder how could MoA do 233B damage to the Imperium while docked.